Never get on your knees again to see the back of the quilt. This camera “sees” the back of the quilt for you and even magnifies it in the high definition monitor. Easily identify poor tension and thread problems before the quilt is advanced. 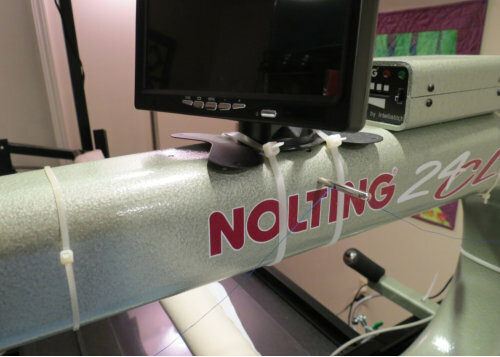 The system can be ordered with a single camera (one under the quilt camera), or dual camera (includes a second camera that mounts on the side laser post). The second camera can be used for panto quilting by following the laser dot in the monitor. Only one camera can be used at a time. The monitor can be swiveled front to back. Installation is easy and all parts for mounting are included. 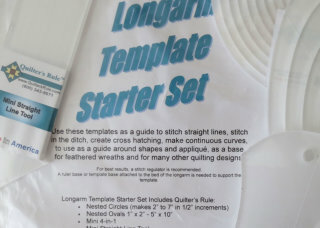 $87.50 The starter set has the most popular Quilter’s Rule templates used for straight lines, circles, ovals, continuous curves, and much more. Included are nested circles, nested ovals, 4-in-1 tool, and the straight line tool. 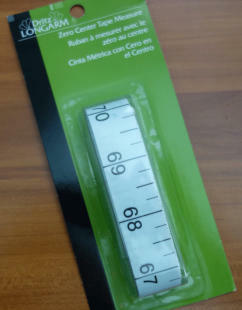 We also carry other templates and rulers. Give us a call, we may have just what you want. $19.00 Replace clamps that tug and pull on a small area of the backing with Side Leader Grips that stabilize the whole side of the quilt. Leader grips are available in different sizes. Select 10” for short throat machines up to 20” throat and 14” side grips for longer throat machines. 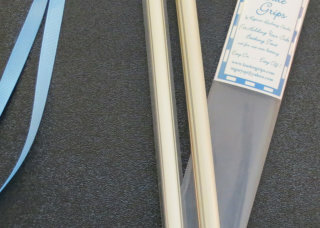 16" - 18" 20" - 24" 26" - 30"
$6.50 This is the most useful “tool” there is to keep your quilt square as you advance the quilt. With the “zero center point” aligned with the center of the leaders, simply keep the same measurement along the sides of the quilt top every time the quilt is advanced. Tape helps to prevent “dog ears” and wavy borders at the bottom of the quilt. Purchase (separately) sticky back Velcro to attach to the end of the frame close to the belly bar roller. 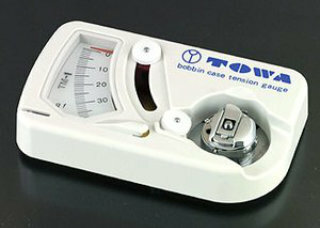 $67.95 Adjusting bobbin tension can be frustrating. Totally remove this frustration by always adjusting the bobbin tension to the same number on the Towa Bobbin Gauge scale with every change of bobbin thread and every bobbin. This scientific device reads the thread tension and allows easy access to the tension adjustment screw without having to remove the bobbin/bobbin case from the device. (bobbin case not included) See video. $200 (yearly subcription) Unlock more Quiltmagine features with the Gold Access Card. Gold unlocks features, like Borders and Corners that offer several placement options to easily place and stitch borders and corners , Fabric Compensation to adjust pattern margins along uneven seams or in unusual spaces, other customization features and access to more free patterns. The Gold Access Card is a yearly subscription that costs $200 per year to unlock and use these features. $9.96 Easily keep track of your bobbins with the Bobbin Saver “Donut.” The flexible rubber “donut” holds at over 20 bobbins, threads won’t tangle or unwind. 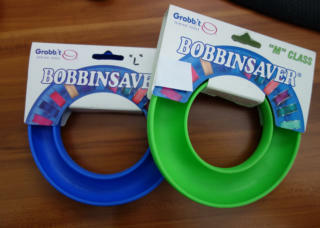 The Bobbin Saver is available in two sizes, L-bobbins, and M-bobbins. Dual Camera $535 Never get on your knees again to see the back of the quilt. This camera “sees” the back of the quilt for you and even magnifies it in the high definition monitor. Easily identify poor tension and thread problems before the quilt is advanced. The system can be ordered with a single camera (one under the quilt camera), or dual camera (includes a second camera that mounts on the side laser post). The second camera can be used for panto quilting by following the laser dot in the monitor. Only one camera can be used at a time. The monitor can be swiveled front to back. Installation is easy and all parts for mounting are included. 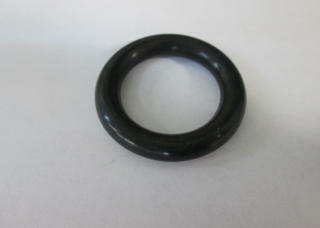 We only sell products that we have tested and use in our studio. We recommend these fine products to make your longarm experience easier, more productive and a lot more fun. 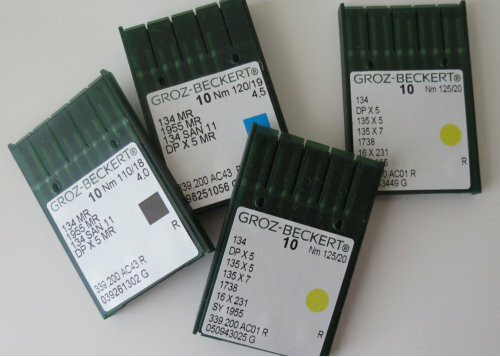 In addition to the products below, we also carry L and M bobbins, template bases, and genuine Nolting replacement parts. Have a need or have a problem ordering? Give us a call. 585.226.2577 Payment accepted securely through Paypal. 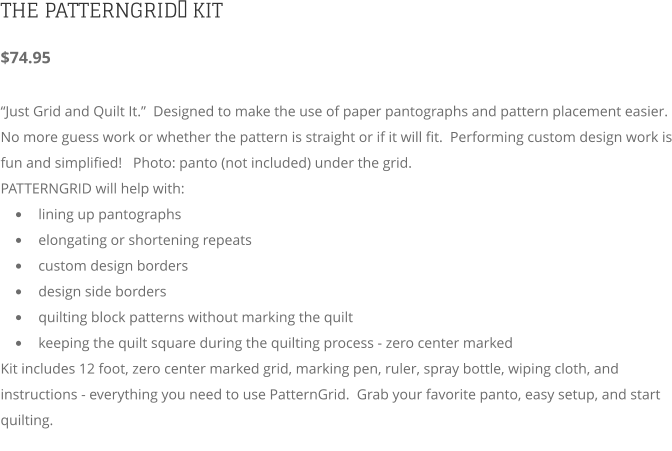 $74.95 “Just Grid and Quilt It.” Designed to make the use of paper pantographs and pattern placement easier. No more guess work or whether the pattern is straight or if it will fit. 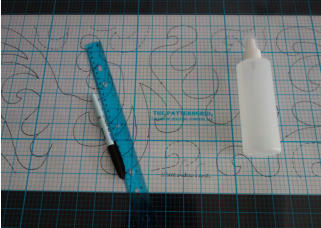 Performing custom design work is fun and simplified! Photo: panto (not included) under the grid. PATTERNGRID will help with: • lining up pantographs • elongating or shortening repeats • custom design borders • design and quilt side borders • quilting block patterns without marking the quilt • keeping the quilt square during the quilting process - zero center marked Kit includes 12 foot, zero center marked grid, marking pen, ruler, spray bottle, wiping cloth, and instructions - everything you need to use PatternGrid. 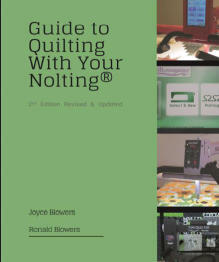 Grab your favorite panto, easy setup, and start quilting. Unlock more Quiltmagine features with the Gold Access Card. Gold unlocks features, like Borders and Corners that offer several placement options to easily place and stitch borders and corners , Fabric Compensation to adjust pattern margins along uneven seams or in unusual spaces, other customization features and access to more free patterns. The Gold Access Card is a yearly subscription that costs $200 per year to unlock and use these features.